Because of its innate natural grandeur, Costa Rica is one of the best places for nature and eco tours in the world! Wildly intense wildlife and dense rainforest make Corcovado and the Osa Peninsula one of the best regions in Costa Rica for Eco Tourism. 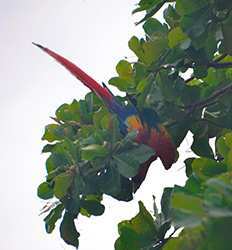 So the next time you visit Costa Rica, join the adventure on one of our Corcovado Nature & Eco Tours. Always wanted to go whale watching? Marino Ballena Whale Watching & Wild Dolphin Combo will be your top choice for whale watching in Costa Rica. If you are interested in spotting big yet gentle whales and up to hundreds of dolphins, navigating around the whale's tale mecca and the whale rock at aptly named Marino Ballena National Park is your best bet. If you love snorkeling, you can take the Caño Island Biological Reserve Snorkel Tour. What makes this eco tour so special is the location itself. Aside from the unspoiled wilderness on both land and sea, the Caño Island Biological Reserve is also rich with mysterious stories about lost treasures, pirates, sacred sites, mystical natives, and many more tales which makes the trip all the more exciting. And the protected reef surrounding Caño Island is teeming with tropical fish and beautiful coral making for the best snorkeling in Costa Rica. You can also choose the Drake Bay Butterfly Garden combo tour which takes you to stroll through a beautiful butterfly sanctuary in Drake Bay and learn about their importance to the regions bio-diversity. For nature lovers, the perfect way to experience the richness of the world's the most biologically intense place is an eco-tour to Corcovado National Park. It's a home of hundreds of species of plants and animals, encompassing an area of around 300 square miles! Walk through the nature trails and discover different species of birds, monkeys, sloths, crocodiles, frogs, and other wildlife on a Corcovado eco tour. 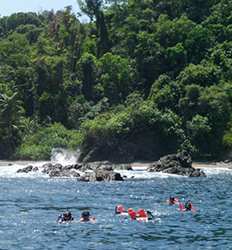 Corcovado eco tours are great ways to feel the warmth of nature. Eco tours by boat and eco tours on land, the Real Deal Tours brings you the best eco tours in Corcovado at the best prices in Costa Rica. So don't wait, choose your favorite Corcovado Nature Tour and start exploring today! Costa Rica enjoys the longest whale season IN THE WORLD. The best place is definitely its Southern Pacific region, around the areas of Osa Peninsula & Drake Bay, where chances of spotting whales while in season is HUMUNGOUS! Yet don't forget the dolphins! Large dolphin populations are also common all along the Pacific coast. 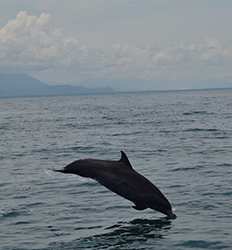 Marino Ballena Whale Watching & Wild Dolphin Combo deposit is $15.00 per Adult and $10.00 per Child. Caño Island is a wild, mysterious island off the coast of Costa Rica, uninhabited by humans and blessed by nature. Although many wild islands take hours if not days to reach, Caño Island is about 1.5 hours away from Playa Uvita. On the way back, you’ll also have a pretty good chance to spot dolphins and even whales if in season. National Geographic refers to Costa Rica's Corcovado National Park as "the most biologically intense place on Earth". Located on the Osa Peninsula, Corcovado is home to about 5% of THE WORLD'S biodiversity, meaning that hundreds of species of plants and animals are encompassed in an area under 300 square miles! An amazing way to explore Costa Rica´s famous bio-diversity, the Caño Island & Drake Bay Butterfly Garden tour offers an incredible experience in sustainable tourism. It also brings you to the beautiful Drake Bay Butterfly Garden. Stroll through the lush garden, planted with species native to the Osa Peninsula like fig trees and wild cocoa. 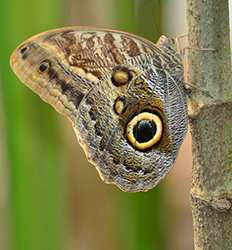 Caño Island & Drake Bay Butterfly Garden Combo Tour deposit is $30.00 per adult and $15.00 per child.